Mercy Burns is officially out in the US today–woohoooo! Miranda from Joyfully reviews says: Mercy Burns is a sizzling mystery that captures you on page one! Mercy and Damon go on one heck of a wild ride in Mercy Burns. These two light up the pages with their witty banter and smokin’ hot chemistry. Mercy is 100% an emotional person she’s leading with her heart while Damon insists his feelings don’t enter the equation. I’m absolutely smitten with these two. Mercy and Damon go on an epic journey together trying to escape danger while managing the burgeoning feelings between them. Keri Arthur pens an enticing romance and a thrilling mystery. 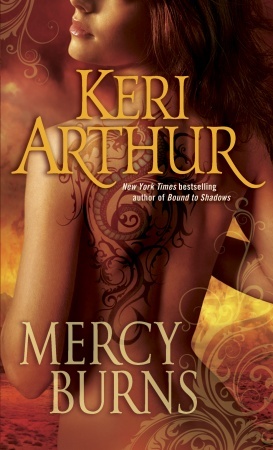 Ms. Arthur makes Mercy Burns stand out not only because it’s a magical story but also because she has precisely the right amount of romance and suspense. Mercy Burns is the second book in Ms. Arthur’s Myth and Magic series but it is not necessary to have read the first book to follow this delicious story. Surrender to Mercy Burns and it will take you on a passionate edge of your seat adventure! Dianna from Night Owl reviews said: Even though this is not a Riley Jenson book it is as good or better than what I have come to expect from Keri Arthur. I had a bad time putting it down to get anything else done. My only question is…“Is this the start of a new series? Or are we going to be stuck with just this one book?” I seriously hope this is the start of another kicking series by Keri Arthur. Danielle from Coffee Time Romance said: Mercy Burns is a complex tale full of twists and turns. This page turner contains one thrilling event after another. I love how Keri Arthur introduces us to another fantastic fantasy world of hers. The adventures and passion and fearsome fighting that are contained within this novel keep you going back for more. The way the storyline effortlessly jumps from one plot to another makes this a smooth read and allowed me to enjoy this tale. It will be interesting to see what comes next for the Myth and Magic series, and I for one cannot wait.